We at Firetail DAQ like to think of DAQ as bringing the real world to your PC whether that be temperature, pressure, strain, flow, voltage, current or in fact any physical variable. 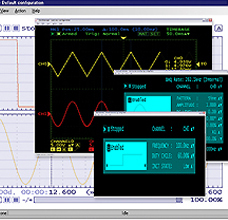 The process is the sampling of electrical signals from sensors that represent real world or physical properties and converting those analog waveforms to a digital format for display, analysis, and storage in a PC. DAQ devices normally require a permanent connection to a PC either by being installed internally in a PC or by external connections such as USB. Internally mounted devices draw their power from the PC. Data Loggers, on the other hand do not need permanent connection to PC and require a battery or separate power supply. Externally connected devices can draw their power from the USB port but this has a limited capability so an external power supply is sometimes required. The articles What is Analog? and What is Digital? Have been written to help you understand the world of Data Acquisition.